The Cook Islands were owned at one time by New Zealand. They gained their independence in 1965, but still rely on the Kiwis for their currency, protection and other services.The Cooks consist of 15 small islands and atolls and is divided into two groups, the Northern Group and the Southern Group, and is scattered over some 850,000 square miles (an area as big as India) but is home to only 14,000 people. 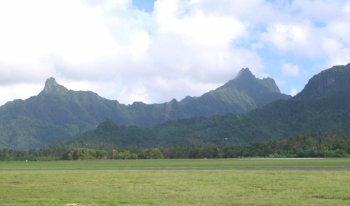 Rarotonga, the largest island at 67 sq km, lies within the southern group and is home to some 8000 residents and is only 22 miles around. The main township of Avarua is the center for administration and shopping. The islands are in the same time zone as Hawaii and are west of Tonga and east of Tahiti. The southern group also includes Aitutaki (pop. 1937), Mangaia (745), Atiu (622), Mauke (468), Mitiaro (230), Palmerston (48), Takutea and Manuae. The more scattered northern group consists of Pukapuka (664), Manihiki (516), Penrhyn (357), Rakahanga (161), Nassau (69) and Suwarrow (4). The main two islands that people visit are the capital, Rarotonga, and a small atoll, Aitutaki. above to visit each island. 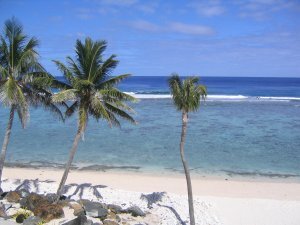 what makes the Cook Islands different from the other islands in the South Pacific is that there are no chain resorts and no chain fast-food restaurants but instead wonderful places to stay that are owned by the locals - Cook Islanders, Kiwis, Aussies and an occasional American. These are people who came to the Cooks and fell in love with the island and are willing to share their little bit of paradise with you. There is only one road circling Rarotonga and there isn’t a stoplight on it. The Cooks are the way the South Pacific used to be! It is also a very safe destination! Click on the buttons above to discover more about this wonderful South Pacific destination. You fly to the Cook Islands on Air New Zealand. In the 11th century, a chief named Toi, built the first coral road in Rarotonga, called Ara Metua. The Spanish explorers first sighted the islands in the 1500’s and in 1773, Captain James Cook sighted the Manuae atoll. Capt. William Bligh sighted Aitutaki in 1789. The Cooks official discovery is credited to Captain Philip Goodenough in the ship, the Cumberland, in 1814. In 1888, Captain Edmund Bourke of the British Admiralty hoisted the British Flag on Rarotonga and claim the islands to be part of the British Dominions. New Zealand annexed the Cooks in June of 1901 and the islands became self-governing in August of 1965. The first missionaries arrived in 1821, when Rev. John Williams of the London Missionary Society, landed on Aitutaki, followed by Papeiha, a Christian convert from Raiatea in 1823. 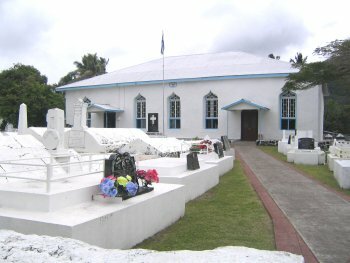 The church is an integral part of the society of the Cook Islands today. Missionaries have exerted a powerful influence over Cook Islands society. The people are avid churchgoers and churches are spread throughout the islands. The Cook Islanders are known for their wonderful singing and a highlight of any visit is to attend a church service. 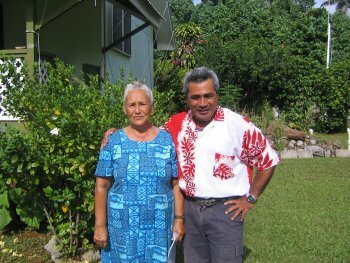 Queen Gina and Ariki Paul on Aitutaki. Descendants of the original founders of the Cook Islands. Cook Islanders speak their own version of Maori, but everyone also speaks English - and they are among the friendliest people in the world! Add to that the current favorable exchange rate, the warm tropical climate, gorgeous, unspoiled beaches and a few crusty South Seas characters right out of Maugham and a very safe destination and you have the perfect vacation. Information courtesy of Jasons Cook Islands guide.